Looking for a gift for a new baby? Look no further! This joyful celebration of a new baby's arrival reminds us of the community that supports each child. 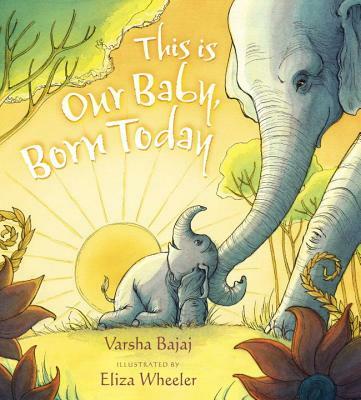 Our dear friend and local author Varsha Bajaj has created a classic picture book for all to share. With a loving mama, a trumpeting herd, curious cousins, and even some dancing peacocks heralding this little one’s arrival, it is apparent that the joy and wonder a new baby brings is shared by all! Varsha Bajaj (www.varshabajaj.com) grew up in a rambling house in Mumbai, India, surrounded by coconut, guava and betel nut trees. When she came to the United States to obtain her master's degree, her adjustment to the country was aided by her awareness of the culture through books. She has written two previous picture books, as well as the middle-grade novel Abby Spencer Goes to Bollywood, which was recently shortlisted for the Cybils Award and included on the Spirit of Texas Reading Program. She lives in Houston, Texas. Eliza Wheeler (www.wheelerstudio.com) wrote and illustrated Miss Maple's Seeds and has also illustrated several picture books and novels. She grew up in northern Wisconsin in a family of teachers, musicians, and artists. Some of the strongest influences on her creativity have been the wild Wisconsin seasons, canoeing the Brule River, picking blueberries with her grandmother, and digging through the snow with her brothers. She received the SCBWI Los Angeles International Conference Portfolio Grand Prize for her artwork. She lives in Los Angeles, California.